This is the second part of a two-part video on piano goals I sort of accidentally created (Here’s part 1 if you missed it). I always feel a strong urge to get organized toward the beginning of the school year, and have been spending my entire week on that project. I’ll probably spend all of next week on the same. So while my head’s all full of piano goals and ideas, I decided to funnel some of that mental energy into a video. Originally it was going to be one video, but I couldn’t stop talking and brainstorming, so it became two. If you missed the first part of this video, definitely check it out – it’ll help give today’s topics more context. Last time we talked about long-term goals, and what questions you should be asking yourself when deciding what songs to learn. Today we’ll take the list of songs I came up with based on those questions, and figure out what to do with them. We’ll also talk about other goals that you maybe haven’t thought of – stuff like getting your piano tuned, or fixing that squeaky pedal. Okay! So now it’s time to round up all of the songs I’ve mentioned (in the previous video). This will give me a sense of if I’m far away from the 40 songs goal, or way overboard. So here’s a look at the pieces I’ve chosen. And it can always change. It’s not like you can’t change your mind on some songs later. But cover all your bases now – it’s better to have some extra ideas as opposed to not enough. You’ll see here that I also jotted down the weaknesses in playing that I mentioned. I want to have all of my to-learn songs, as well as my main goals, all in one place, ideally on one page. That way, I’ll look at it a lot, and drill into my head the idea of, say, playing with precision. Also note any other yearly goals. Again, this doesn’t have to be set in stone, but it’s something that you should be thinking about now. I want to note that it’s tough to make your own goals as a beginner piano student – it’s much easier if you can sit down with a teacher and set goals, because they’ll have a better idea of what songs you’ll be capable of, and the things you need to work on. If you are on your own, though, consult the syllabus. Do a little bit of research and figure out what level you’re at – more or less. Find some songs at that level, if you have no idea what to work on. Maybe you’re at level 5, and you’re like “Yes let’s learn some Beethoven sonatas”, but then you’ll notice that Beethoven sonatas don’t pop up until grade 9/10 level. But you’ll see other pieces like Beethoven’s Bagatelles or German Dances, and you can learn those instead to build up your skills. One other thing I want to mention with goal setting, is don’t just consider the music. What about your environment? What about your keyboard or piano? My big piano needs a little fixing up, since some of the keys stick. It could also handle a tuning. My keyboard is squeaky – both the bench, and the damper pedal. That’s probably an easy fix for someone handy, and it needs to be done ASAP. Maybe you’ve been planning on buying a new keyboard – add that to your goals. What about your practice space? Are you in a dank basement? Maybe there are some minor improvements you could make so that your space is more appealing and inviting – so that you look at it and say, “ahh, practice time” instead of avoiding it. I love plants and flowers, so aside from my big green plant in the corner, I want to pick up another plant or two to sit on top of my piano. I also passionately love seasonal decorations – seasonal tea – seasonal clothes – anything along those lines, so I want to start accumulating little decorative touches that’ll change with the seasons. What about the lighting? If it’s dark in your room, get a lamp so you’re not squinting at your sheet music. Do you have a good bench, or are you still using a chair? Do you have all the tools you need, such as a metronome? Do you have a practice notebook, or some place you can take notes? Do you have an adequate music library for sight reading and learning? Rewards. I am a believer in the power of positive reinforcement. If you meet your goals in a month – say you learn the four songs you planned on learning – what can you do for yourself as a nice “thank you”? Spend the night doing some creative writing or an art project – or whatever you’ve been putting off because it seems “pointless”. You owe yourself a date. Maybe you’re expected to take a significant other on dates, but what about yourself? Maybe it’s a nice walk with a good CD, or a glass of wine or beer while reading random things on the internet. Maybe it’s that fiction book that you really want to read, but have been talking yourself out of because it’s “trashy” or “beneath you”. If you can afford it, one of THE best rewards is a massage. Playing piano can be hard on the body (unless your posture is completely perfect) – I find my upper back especially benefits from a massage every month or two. Pure luxury, but it’s the best. What about going to your favorite coffee place just to hang out? Bring a book, or your laptop or tablet. I’m also not above rewarding myself with shopping – Maybe I’ve had my eye on something, and with a month’s good behavior, I can justify treating myself. I mean, rewards can be free too, if you don’t have the extra funds, but I’m definitely motivated by a good treat. So how do I keep track of all these goals? Well, I’m going to pin up the word document I showed you onto my cork board, so it’s there in front of my face all year. One thing I like doing – and this isn’t for everyone – is using Pinterest. Hear me out! I like having quick and easy access to my favorite recordings for the songs I’m learning, so I use a Pinterest board to keep track of all those songs. 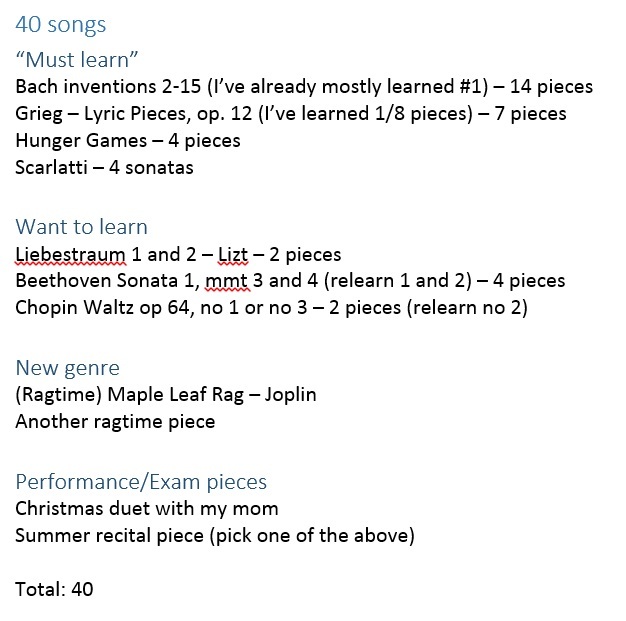 If you’re at all interested in finding my board, username is allysiak and the board is “piano songs to learn”. Another digital option is Trello, which I use for a bunch of things, and you can also link/embed videos. Then there are good streaming apps – I use Google Play for $10/mo, and this lets me make playlists of basically anything. It’s extremely useful for teaching, and also my own personal use. Obviously there’s the option of pen and paper as well, but those are my favorite electronic/digital options. So there you have it! Goal setting can be kind of a drag for some people (I personally really enjoy it), but it’s so important and helps keep things organized and running smoothly.